What's better than a nice, juicy burger when you're enjoying a fabulous Myrtle Beach vacation? You could opt for the same-old, same-old options available at any number of fast-food eateries scattered around the Grand Strand, or you could try out one of the following establishments that each bring something unique to your burger experience! There are seven different River City Cafe locations along the Grand Strand, from Murrells Inlet to Myrtle Beach to North Myrtle Beach, and they all serve both traditional burgers and more unique options. You could stay safe and order the House Cheeseburger, featuring all of the typical accompaniments, or venture out and try something unusual like the notorious Peanut Butter Burger or Cheetos Burger, which taste exactly like they sound. Go all out and order the "Kitchen Sink" Burger Platter, which comes with two patties stacked with Texas chili, hickory smoked bacon, grilled onions, jalapenos, mushrooms, Swiss and cheddar, lettuce, tomato, pickles, mustard, and mayo, and stuffed between two grilled cheeses, served with a pile of fries, two giant fried onion rings, and slaw. You definitely don't have to worry about lack of variety when you go for a burger at River City Cafe! Even though it's known for its wide variety of delicious beverages, Margaritaville offers up great burgers inspired by acclaimed recording artist Jimmy Buffett. Located at Broadway at the Beach, this dining establishment immerses you in the sights, sounds, and tastes of the Islands! Try the signature Cheeseburger in Paradise, featuring American cheese, lettuce, tomato, and pickles. For a burger with an Italian flare, try their Caprese Burger, which comes with fresh mozzarella cheese, tomato, fresh basil and a balsamic glaze. There are many other hamburger options on the menu, as well as something a little bit different: the Bison Burger topped with gouda cheese, tomato, lettuce and BBQ aioli. If you're looking for a place that combines a great variety of drinks with an amazing burger selection, try out Jimmy Buffett's Margaritaville! This oceanfront establishment in the heart of Myrtle Beach prides itself on artistically-styled and themed drinks, burgers, and sushi. ART Burger Sushi Bar emphasizes gourmet quality in a fun and unique atmosphere. 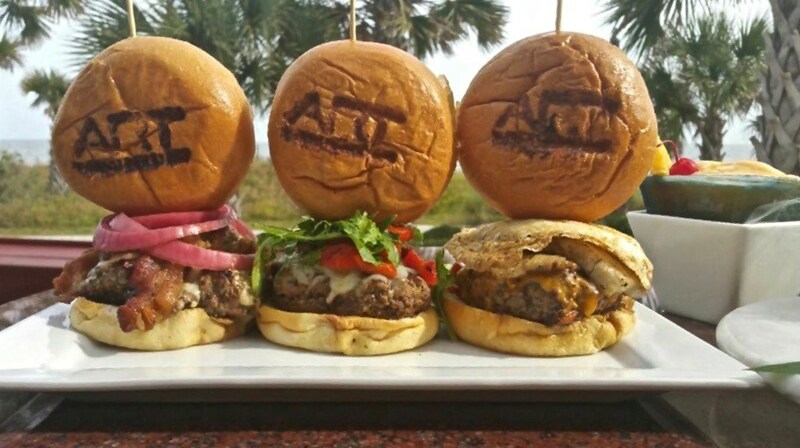 Using only responsibly-raised, grass-fed beef with no added hormones or antibiotics, ART provides guests with many wonderful burger choices! Mostly named for famous artists, burgers range from traditional (Rockwell All American Burger) to more distinct choices like the Picasso, made with Ground Beef Patty topped with Blue Cheese Crumbles, Marinated Red Onions, Lettuce, Tomato, and Blue Cheese Sauce, or the Dali, featuring Ground Beef Patty, Fried Pickles, Avocado Ranch, Lettuce and Tomato. Receive a lesson in art as you enjoy the artistic creations served up by the ART chefs. This burger joint with strong Hollywood ties has taken Myrtle Beach by storm since setting up shop at Broadway at the Beach. Though they serve an array of food selections including sandwiches and salads, the namesake burgers are what make this place a gem. Try out The Melt, a 1/3 lb. burger, topped with American "government" cheese, bacon, caramelized onions, house made pickles, and mustard, served between thick-cut bread slices, or go traditional with The Our Burger, featuring all of you favorite accompaniments. Travel back to your childhood when you get Mom's Sloppy Joe, an open-faced sandwich on thick sliced griddled bread smothered with house made sloppy Joe and finished with crispy onions, Paul's signature wahl sauce, and house made cheese sauce. We like this winning combination! Stop by Broadway at the Beach and give Wahlburgers a try. Located just south of Myrtle Beach in Murrells Inlet, South Carolina, Poppy's Burgers & Subs is a locally-owned and operated dining establishment that focuses on fresh and never frozen hamburgers. There's no shortage of choices when you dine at Poppy's. Like other burger joints, they offer traditional options like regular hamburger, cheeseburger, and bacon cheeseburger, but we suggest taking the bold step towards one of their many other unique options! Try the Smokehouse Burger, topped with grilled ham, bacon, cheddar cheese, and smothered with BBQ sauce, or the Mexican Burger, piled high with grilled jalapenos, then topped with salsa, tortilla strips, and covered with cheddar cheese. Operated by a chef with more than two decades of experience in the restaurant industry, you won't be disappointed when stop by and grab a burger from Poppy's Burgers & Subs! No matter where you decide to stop for a burger during your vacation, you're sure to enjoy one of these special restaurants that bring you more hamburger options than you could imagine! Let us know what you think!